March 29, 2012  President Obama renewed his call for lawmakers to end tax subsidies for big oil companies on Thursday. But the measure failed on a procedural vote in the Senate. Some say the issue is more about political posturing than realistically addressing the high price of gasoline. March 23, 2012  President Obama's pick to lead the World Bank is an unconventional choice with a background in global health and development. The current monetary group head has a trade and economic background. 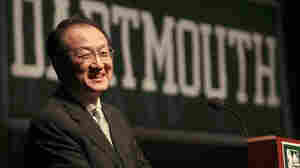 Jim Yong Kim currently serves as president of Dartmouth College. March 23, 2012  President Obama spent the past two days traveling the country, touting his all-of-the-above energy strategy. He is promoting solar power and wind power, but says brain power — as in American ingenuity — is also key to curbing the nation's dependence on foreign oil. March 22, 2012  The second day of President Obama's all-of-the-above energy tour brought him to Oklahoma. March 22, 2012  President Obama is on a multi-state tour to defend his administration's energy policies, answering charges by Republicans that he's responsible for rising gasoline prices. March 21, 2012  President Obama traveled west on Wednesday, where he stopped at a solar energy facility in Boulder City, Nevada. The two-day trip is designed to sell the administration's "all-of-the-above" energy strategy. March 19, 2012  President Obama's re-election campaign hauled in more than $45 million last month. That's up from January, but less than he raised during the same period four years ago. March 15, 2012  Vice President Joseph Biden campaigned in Toledo, Ohio, on Tuesday. At a United Auto Workers union hall, he gave the first in a planned series of speeches in states designed to frame the Obama-Biden re-election rational. Afterward, he stopped by a Jeep factory to shake hands with workers at the shift change. March 15, 2012  On Thursday, Vice President Joe Biden will give the first in a series of campaign speeches designed to frame the debate for the November election. He's speaking in Ohio, where the Obama campaign notes that 120,000 people are directly employed by the auto industry. March 15, 2012  On Thursday, Vice President Joe Biden travels to Toledo, Ohio, where he'll give the first of four "framing speeches" for the campaign. He'll be talking about what the auto rescue means for that state, and its industrial workforce. March 14, 2012  On Tuesday, President Obama received the endorsement of the nation's largest organized labor organization, the AFL-CIO. Collective bargaining has been under attack in several states, which has drained union resources. But labor leaders say that's made them more determined than ever to keep Obama in the White House. March 10, 2012  The American job market is still a long way from healthy, but its pulse feels a lot stronger now than it did six months ago. The improvement is a boon for President Obama as he tries to hold onto his own job in November, but both he and his Republican rivals say 8.3 percent unemployment is not low enough. 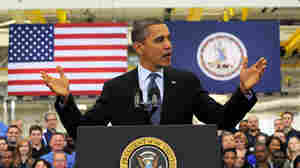 March 8, 2012  President Obama was in North Carolina Wednesday, dropping in on a factory that makes big-rig trucks. Some of those trucks are powered by natural gas, and Obama took the opportunity to propose new tax incentives for alternative-fuel vehicles. March 7, 2012  President Obama held a wide-ranging news conference Tuesday. He bluntly challenged Republican critics of his Iran policy — saying the stakes are too high to let politics intrude. The news conference was designed to steal some of the spotlight from GOP presidential hopefuls on Super Tuesday. March 6, 2012  President Obama held a news conference on Tuesday afternoon, his first since November. While the president opened by announcing yet another initiative to help homeowners through the on going foreclosure crisis, nearly all of the questions involved foreign policy. His answers took aim at his Republican challengers: "This is not a game," he said.